The globetrotting party word game for PlayLink! Dive into a whole new world of competitive word games with your guide, Amy the Aviator. Fly around the globe to different cities, win rounds and claim letters from each location while blocking your opponents. Use the free Wordhunters smart device App as a game controller to compete in 15 party-play word games suitable for the whole family. Test both your skills and your brain power in fun challenges like "Word Sushi", "Alphabetty Forgetty", and "Disemvowelled", with endless replayability! 15 party word games suitable for the whole family! Take off to 20 global destinations from London to Tokyo and beyond! Play in front of famous landmarks including the Eiffel Tower, Sydney Opera House, and Empire State building! Drop-in / drop-out multiplayer for 2-6 Wordhunters! Easily change language within the game and practice your foreign vocabulary in French, Italian, German, and Spanish! All players must play Wordhunters in the same room  the fun takes place around one PS4. 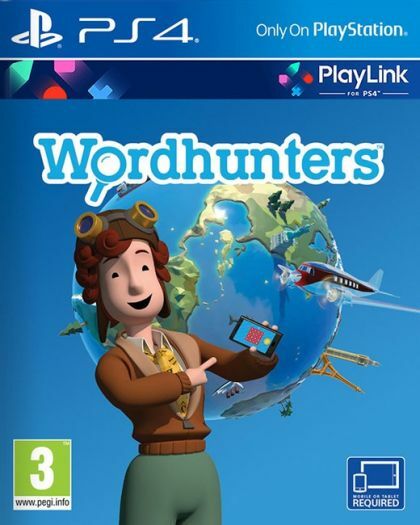 Everyone should download and install the free Wordhunters app to their tablet/smartphone from their device's app store  and then connect their device to the same Wi-Fi network as the PS4 console. Note: you need the Wordhunters companion app on your iOS / Android device to play this game.